If you search for the terms “marijuana” and “Georgia” in today’s news, you’ll read about Leroy Hill, the NFL free agent who was arrested in Atlanta with less than an ounce of the drug. Dumb move by Hill, whose lucrative career could hinge on an arrest like this, but how much law enforcement time and court expense should we devote to a crime like that? Mandatory minimum sentences for minor drug infractions now seem like a relic when other states have legalized the sale of marijuana and make it available in retail storefronts. While it remains well within Georgia’s rights to keep marijuana illegal, incarcerating users at the expense of the taxpayer while other states have created industries around selling the drug as medicine is a paradox that will not stand the test of time – or more importantly, a lingering budget crunch. Furthermore, setting felony convictions for relatively minor offenses diminishes the prospect that the offender will ever be able to find employment at a level that would allow for self sufficiency. As such, the balance of how harshly to treat those who commit minor offenses as a deterrent must be weighed against the long term cost in the loss of the individual’s future employment possibilities. I’m sure the majority of Georgians would still oppose legalizing marijuana, but it’s hard to ignore the broader points about law enforcement priorities and expenditures. 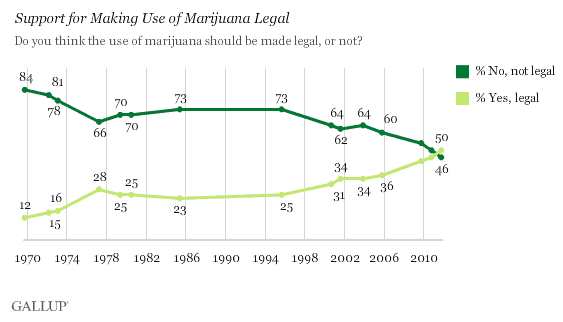 It’s even harder to ignore the evolving national position about the drug.